Lunch is one of my favorite parts of the day. I love just having an hour to let my brain relax and get prepared for the afternoon. I typically pack my lunch every day and enjoy eating it outside. For my first day in the DR Office, so was not the case. As my R2-D2 Lunchbox did not travel with me, I had new lunch plans. And, for the day, those plans involved Lunch being delivered to me. I’m really not sure the source of the food. I know it was from a location nearby. All I know is I was presented with 3 choices and went with Door #1. Door #1 consisted of Grilled Chicken, White Rice, Red Beans and ‘Salad.’ The food arrived and we got set up to eat in the conference room. Upon opening of the styrofoam container, there appeared to be a large amount of food. The chicken appeared to be nicely grilled & the beans appeared to be non-existent. Let’s begin with the chicken. This was, by far, the most dry & flavorless chicken I have ever had. Even though I had a thigh and leg, the darkness of the chicken did not provide any flavor. I had to choke down every bite of the chicken that I ate – it was that dry. As for the lack of flavor, it didn’t even have just basic chicken flavor. It just tasted like dry nothing. Blah. Last but certainly not least, was the white rice. This was absolutely just amazing. It was just simple & pure & ohh so perfect. The rice was not bombarded with any flavors other than…white rice. And boy, did I love it. It may have been a huge serving of rice – one that I would typically not each at lunch – but I ate every single bite of it. By far, some of the best white rice I have ever, ever had. Simple – that is the best way to describe this. 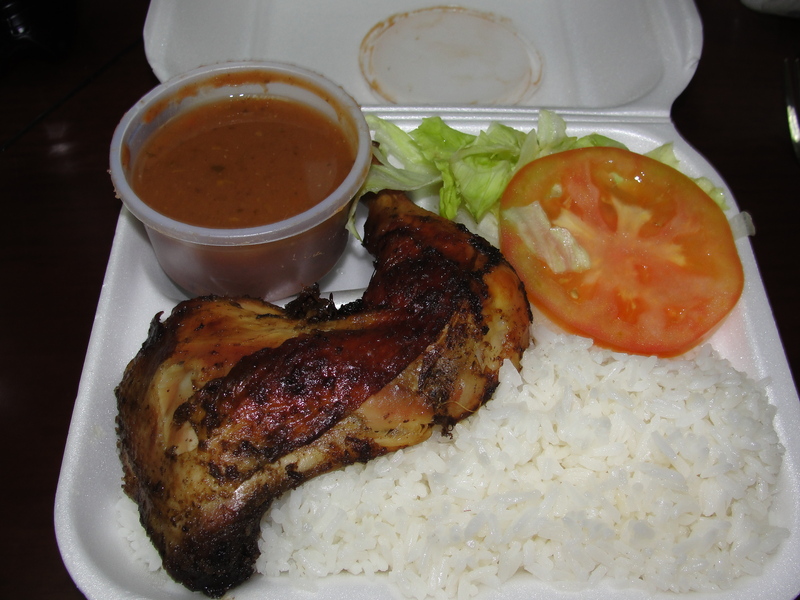 My first lunch in the DR was nothing to write home about – besides the rice, of course. But, it was still somewhat enjoyable. Plus, it was really nice spending the time with my DR Team. Perhaps next time, I will opt completely out of anything but that white rice. Door #1 was not the right choice for me. Door #Rice surely was.